Heyya peeps. I'm Reckless, aka Reckless Abandon. I don't know why Mom calls me Monster and Badboy sometimes though. Haha! I came from Blue Cedar kennels in Nevada where I was born November 12th, 2006. 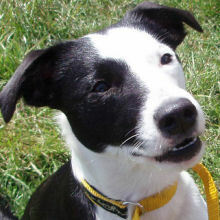 I'm a "Sportster" - three parts border collie, two parts whippet, and one part each of staffy, border terrier and JRT. When I was still a youngster, I flew north, and now live in Crofton, BC with my mom Kelly, Quincy the cat, and my canine sisters Maggie, Boom-boom, Kybosh and Little Monkey. Mom and Maggie had started playing flyball long before I showed up on the scene, so it was only natural that I play as well. It sure is fun to play a team sport with other dogs and people! 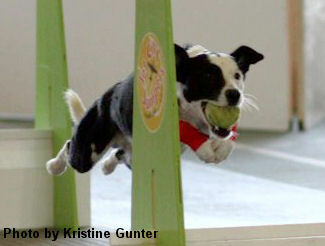 Destined to be a flyball superstar, I started my training immediately upon my arrival in January 2007. My biggest challenge in training was having to overcome a crash with my teammate Chum just weeks before I was set to debut. Otherwise, I was a natural at flyball, if I may say so myself! I first made the tournament roster March 15th, 2008, but since I was still recovering from that crash, it wasn't until April 5th, 2008 that I actually earned my first points. Mom shed a few tears; she was so happy. She's such a sap sometimes! Well, not only did I run clean, but I ran a 4.00 in my first race. Not bad for a rookie! My best time to date is 3.83. Outside of flyball, I really like agility, and Mom and I are learning Canine Freestyle and loving it. She's taught me all sorts of tricks; I make it so easy for her. My favourites are sneezing, crawling backwards, hopping up on Mom's back, and hiding my face behind my paw. Mom calls that one "shame on you". I love to play tug more than anything, and when the day winds down, there is no better place than Mom's lap.